Discover the beauty of the St Anna and Gryt archipelago on this self-guided sea kayaking holiday in Sweden suitable for both adults and families and for novice or more experienced paddlers, exploring the islands from your base accommodation in cabin, guest house or tree tent. The Gryt archipelago is part of the larger St Anna island network and is one of Sweden's premier kayaking areas, known for the beauty of its natural landscape and ideal for exploring by sea kayak. 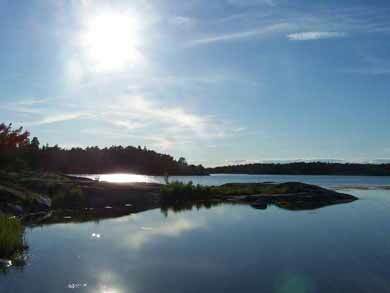 Island cabin or guest house options can be extended with extra nights' wild camping in the archipelago. Photo: C Swanson. 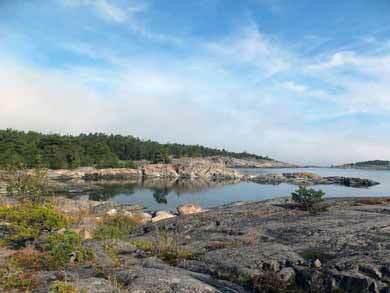 There are several options to choose from to create your own kayak adventure in the St Anna and Gryt archipelago. Any of the options can be extended with extra night(s) in the same accommodation type. If choosing the cabin or guest house options, you can also add an expedition component to the trip with extra night(s) wild camping. From your chosen base, you are free to plan your days as you wish, taking to the water to explore as much or as little of the archipelago as your time, energy and level of experience permits. 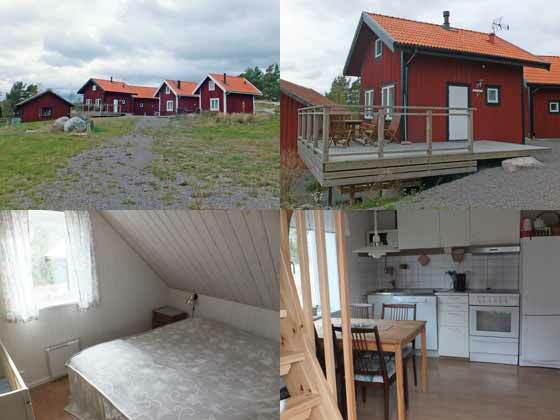 Option 1 - Simple or Upgraded Cabin on the Island of Harstena (min. age 15): For this option, you paddle between the mainland and the island where the cabins are located (min. paddle time around 4 hours), either in one day or over two days if adding extra night(s) camping, both at the start and end of the tour. Option 2 - Guest House on the Mainland (min. age 7): Ideal for novices, families and/or those who would like a catered element to their stay, located just 15 mins from the kayak centre by bicycle (provided) for each day's paddling. Option 3 - Camping in Tree Tents (min. age 15): A unique camping experience in your own "tree tent" suspended in mid-air! The tents, which can sleep 2-3 persons, are straightforward to erect. Instructions for using the tent and advice on suitable island/location to pitch your tent for your first overnight will be advised at the start depending on weather/wind conditions. We recommend that you use the tent as a fixed base camp for day tours from same location, but if you wish you are welcome also to move overnight location during the trip. Extra night(s) at the Guest House on the Mainland before/after any of the three options can also be arranged as an optional extra. Tree tents are an exciting and unusual option for accommodation during your tour! Photo: C Swanson. For novice or less experienced adult paddlers, it is an accessible introduction to the activity of sea kayaking, with possibilities to spend as much time on (or off!) the water as you wish. For families (Option 2), as this requires no commitment to paddle particular distances or cross large areas of water, this is the ideal choice for active families with children aged 7 or above who enjoy spending time with their children on the water. More experienced kayakers can take the opportunity to explore further afield and increase the level of challenge, with the option to incorporate an expedition component into the tour by adding extra nights wild camping. For those who enjoy the outdoors but also appreciate a roof over their heads at night, this is the ideal combination of adventure and simple comfort (and you can also spend some extra nights camping too if you wish!). Possible start times 09.00-17.00 by arrangement. Meet at the kayak centre for information/equipment. NB: Note that paddle time to Harstena is minimum around 4 hours non-stop, though we recommend taking additional time to enjoy the landscape. If choosing this option you must therefore allow ample time to reach Harstena in daylight and so should plan your start time accordingly, especially if travelling towards the end of the season when hours of daylight are shorter. 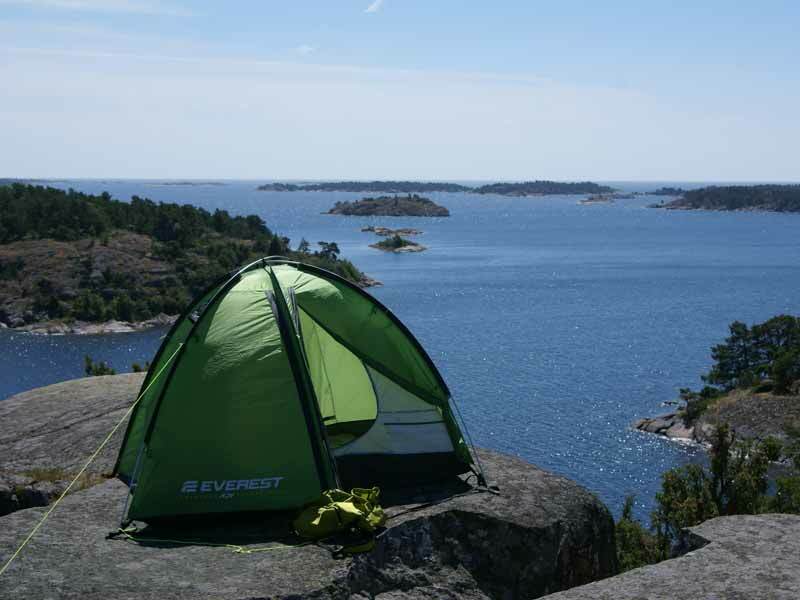 Alternatively, if adding extra days camping to your tour, you could choose to take two days to reach Harstena, camping on the way, and have your cabin nights later in your tour. Please specify your cabin dates on booking. You will begin your experience from the kayak camp. The route to Harstena is around 8km (extensions optional) and takes you through a network of islands with many possibilities to stop. Explore the sandy beach of Sandö and the lovely lagoon of Långholmen before paddling out towards Gubbökupa, a fine spot for lunch 30m above the water and with a 360 degree view of the surrounding archipelago. 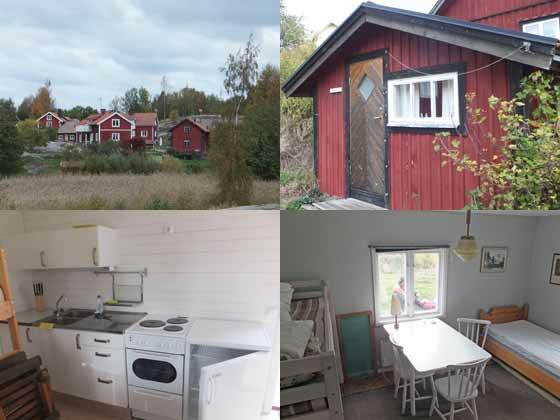 Continue via Klubben and on to the island of Harstena, where your cabin accommodation is located. On Harstena you will check in to your cabin. Kayaking to/from Harstena requires crossing some areas of open water and is recommended only if you have previous experience of kayaking and are comfortable paddling independently in a marine environment. Kayak centre staff will meet you either at the guest house or the kayak centre depending on your preference (please specify on booking). Check-in at the guest house is from 13.00. Meet at the kayak centre for information and equipment. You will be advised on a suitable location to paddle to for first overnight depending on wind/weather conditions and time availble. Closest suitable point approx. 30 mins' paddle from the kayak centre. Plan start time accordingly to allow ample time to reach the island in daylight, especially if travelling towards the end of the season when daylight hours are shorter. 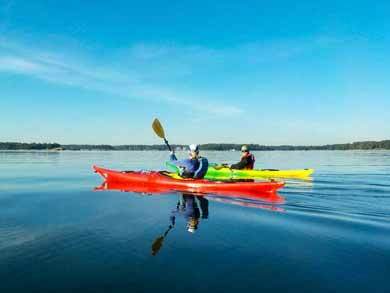 Self-guided kayak tours in the surrounding archipelago. A wide choice of options for exploring the beautiful island landscape is available. Distance covered and level of challenge is entirely flexible depending on factors such as your level of experience/fitness and wind/weather conditions. For novices or families, there is accessible paddling close to shore, while more experienced paddlers can choose to explore further afield. Depending on the tour option chosen, you may be combining cabin or guest house accommodation with additional night(s) camping, giving the flexibility to spend some nights under canvas, camping wild beneath the stars. 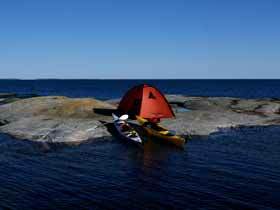 Option 1 - Cabin on Harstena: Kayak back to the kayak centre (min. paddle time 4 hours non-stop) for departure. Option 2 - Guest House: Please check out of the guest house by 12.00. 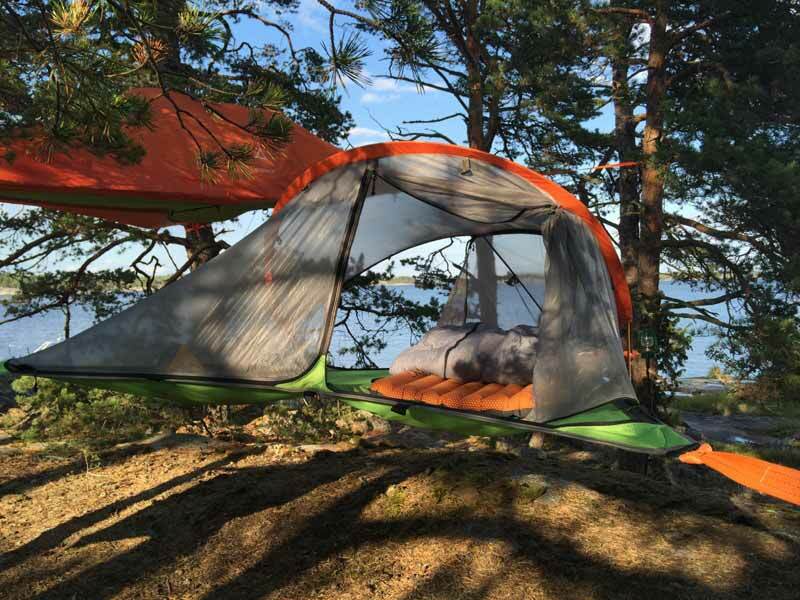 Option 3 - Tree Tents: Pack up your tree tent and paddle with the tent (distance/time depending on how you have planned your tour) back to the kayak centre for departure. Start/end any day by arrangement between 09.00 and 17.00 from mid-May to end September. Both single (K1) and double kayaks (K2) are available. Please specify your requirements on booking. NB: Bedding and towels must be added to all Option 1 prices. Tent: Tents provided are simple dome tents suitable for 2-3 persons. Price for tent is for the duration of your trip, not per day. NB: Note that these are not the "tree tents" featured in accommodation Option 3 - the tree tents cannot be used as tents for extra nights in combination with other accommodation options. Sleeping bag package: Sleeping bag + foam mat. Price is for the duration of your tour, not per day. Please bring own sleeping sheet. 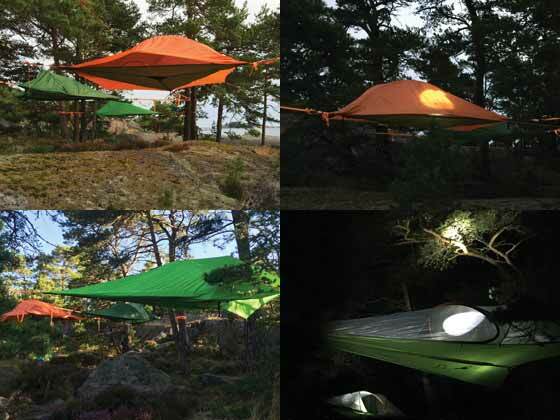 NB: Sleeping mat is not provided for Option 3 (Tree Tents) as a mat is not required for the tents. Wetsuit: Not normally considered necessary, but available to hire if required. Please contact us for prices. Short and full-length wetsuits are available. For any of the three tour options, extra night(s) can be added at the Guest House on the mainland before and/or after your tour. Room prices also apply for single occupancy and includes breakfast. If arriving by public transport, local transfers are required between bus stop at Gryt and kayak centre on arrival/departure (approx. 4km). Price one-way per group of up to 4 persons. For groups larger than 4 persons, please contact us for details and prices. If choosing Option 2 - Guest House on the Mainland, or if staying extra night(s) at the Guest House before your tour, transfer will not normally be required, as you can get off the bus at the Guest House. Sea kayak, paddles, buoyancy aids, splash skirt, night cover, safety equipment, bilge pump and waterproof bags. Stable two-person (K2) kayaks (recommended for novices and families and also suitable for two adults + child) and single (K1) kayaks are available, in PE plastic or fibreglass. Tahe Marine, Everest and EPIC kayaks are used - some of the kayaks have rudders and skegs while others have Smart Track rudder control system. Please specify when booking whether you would prefer K1 or K2 kayaks. Sea map. Information and suggestions on route options will be given at the start of the tour. Option 3 (Tree Tents) only: Sleeping bag and kitchen equipment (cooker, pans, fuel, plates, mug, washing up liquid) are provided. Please bring own cutlery and sleeping sheet (sleeping mat is not required in the tree tents). Bedding/towels are included for nights at the cabins or guest house. Guests planning to camp for additional nights should bring own towels, sleeping bag and sleeping mat for these nights. 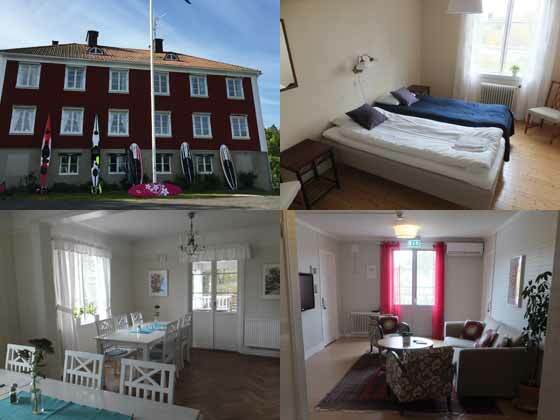 Two nights in self-catering cabin accommodation on Harstena. Simple Cabin: The cabins vary in size and specifications depending on availability, but are typically simple but cosy and comfortable camping cabins sleeping 2-4 persons (bunk beds) with small kitchen for self-catering. WC/shower in separate building. Typical cabins for the "Simple Cabin" option. Upgraded Cabin: Comfortable cabins approx. 40-45 square metres with lovely views of the sea. Cabins are approx. 150m from the water, where there are bathing rocks and pebble beach. Fully-equipped kitchen for self-catering with cooker, fridge/freezer and dishwasher. 1 x 2-person bedroom with double/twin, one bed + extra bed in open landing area. Bathroom with toilet and shower. Shared outside barbecue area. Typical cabins for the "Upgraded Cabin" option. 2-person rooms with shared WC/shower facilities (please contact us for prices if you would like room with en-suite shower/WC). Breakfast is included. Lunch packages and dinner can be arranged locally. Bikes (adult size only) with helmets and locks are provided to cycle the 15 mins between the guest house and the kayak centre for kayaking day tours. Accommodation for Guest House on the Mainland option. Option 1 (Cabin on Harstena): There is a small restaurant and bakery on Harstena open during high season (normally from Midsummer to mid-August). Note that, especially if travelling outside high season, there may be no facilities open on Harstena for provisions and we recommend purchasing all essential provisions for your tour before leaving the mainland. Option 2 (Guest House): Breakfast is included and lunch packages and dinner can be arranged locally. Option 3 (Tree Tents): Please purchase all provisions before beginning your tour. Depending on the dates of your tour, there may be small stores open to purchase provisions in the area, but these should not be relied upon. End cleaning: For Option 1 (Cabin on Harstena), please clean your cabin accommodation before departure. No previous experience of sea kayaking is required, though guests with limited experience should choose Option 2 (Guest House) or Option 3 (Tree Tents) and families should choose Option 2. Option 1 (Cabin on Harstena): Min. age 15. Requires paddle time of min. 4 hours non-stop between the mainland and Harstena. You should have some previous kayaking experience and be comfortable travelling independently in a marine environment and crossing areas of open water. Option 2 (Guest House on Mainland): Min. age 7 if sharing kayak with an adult or 13 (with some previous kayak experience) to use single kayak. Option 3 (Tree Tents): Min. age 15. Requires 1-2 hours' paddling to reach the island where the tents are located. For day tours from fixed base (any option), distance covered and level of challenge is flexible depending on experience/ability. We recommend that novices and families choose double kayaks, which are the most stable option. Swimming ability required for all adult and child participants. You should be in good health, have a normal level of fitness and enjoy the outdoors. Minimum 2 adults (18+) required. While strong winds are rare, weather conditions can of course vary and you should be comfortable on the water in different conditions and bear in mind that this a is self-guided tour. Please don't hesitate to ask if you have any questions regarding your suitability for the experience. There are no currents/tides in the archipelago. When choosing Option 2 (Guest House on the Mainland), there is no requirement to cover a minimum distance and the level of challenge can be very accessible if needed, keeping close to land, etc. For Options 1 and 3, level of challenge is moderate as you must paddle between the mainland and the accommodation locations. Note that water can be very cold if paddling early/late in the season. This experience is also suitable for groups. Please contact us to discuss your requirements. The island of Harstena, where your cabin accommodation is located, lies in the northern part of the Gryt archipelago and is a lovely area with well-preserved archipelago natural and cultural heritage. Harstena is an ideal base for exploring this region. Fly to Stockholm. Travel by coach or train + bus to Valdemarsvik (approx. 2.5-3 hours) for local bus to Gryt (20 mins). Transfer between Gryt and the kayak centre (4km) is available as an optional extra. Ferry Dover-Dunkirk or Newcastle-Amsterdam for onward train + bus connections to Valdemarsvik.